The New York Times bestseller! 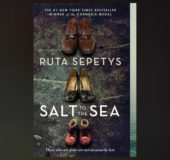 All the Light We Cannot See meets Titanic in this emotionally wrought, masterful work of historical fiction from award-winning and internationally bestselling author Ruta Sepetys, in a gorgeous new paperback package. Engines buzzed in a swarm above. Der Schwarze Tod, “the Black Death,” they called them. I hid beneath the trees. The planes weren’t visible, but I felt them. Close. Trapped by darkness both ahead and behind, I weighed my options. An explosion detonated and death crept closer, curling around me in fingers of smoke. “You are a talented young man, Florian.” That’s what Mother had said. “You are Prussian. Make your own decisions, son,” said my father. I would rest a moment. I had a moment, didn’t I? I slid across the cold, hard earth toward the back of the cave. The ground quivered. Soldiers were close. I had to move but felt so tired. It was a good idea to put branches over the mouth of the forest cellar. Wasn’t it? No one would trek this far off the road. Would they? I pulled the pink woolen cap down over my ears and tugged my coat closed near my throat. Despite my bundled layers, January’s teeth bit sharp. My fingers had lost all feeling. Pieces of my hair, frozen crisp to my collar, tore as I turned my head. So I thought of August. He didn’t listen, didn’t understand, or didn’t care. He pointed his gun at me and yanked at my ankle. “Shh, Fräulein.” He lodged the gun under the bone of my chin. “Thank you, sailor.” Her warm whisper lingered in my ear. She was quite pretty and smelled like fresh eggs, but there have been many grateful and pretty girls. Oh, do not be concerned. You and your red sweater are foremost in my thoughts. How fondly, how incessantly, I think of my Hannelore and red-sweater days. I’m relieved you are not here to see this. Your sugared heart could not bear the treacherous circumstances here in the port of Gotenhafen. At this very moment, I am guarding dangerous explosives. I am serving Germany well. Only seventeen, yet carrying more valor than those twice my years. There is talk of an honor ceremony but I’m too busy fighting for the Führer to accept honors. Honors are for the dead, I’ve told them. We must fight while we are alive! She wasn’t a woman. She was a girl in a pink woolen cap. And she had fainted. I scavenged through the Russian’s frozen pockets and took cigarettes, a flask, a large sausage wrapped in paper, his gun, and ammunition. He wore two watches on each wrist, trophies collected from his victims. I didn’t touch them. This Russian wasn’t alone. There would be more. I had to move. I turned the top on the soldier’s flask and raised it to my nose. Vodka. I opened my coat, then my shirt, and poured the alcohol down my side. The intensity of the pain produced a flash in front of my eyes. My ruptured flesh fought back, twisting and pulsing. I took a breath, bit back a yell, and tortured the gash with the remainder of the alcohol. “Are you okay?” I asked, barely recognizing my own voice. His face twisted at the sound of my words. The dirt pulsed slightly. How much time had passed? “We have to go,” I told him. I tried to use my best German. In my head the sentences were intact, but I wasn’t sure they came out that way. Sometimes when I spoke German people laughed at me and then I knew my words were wrong. I lowered my arm and saw my sleeve, splattered with Russian blood. Would this ever end? Tears stirred inside of me. I did not want to cry. His eyes on the potato said, Emilia, I’m hungry. The dried blood on his shirt said, Emilia, I’m injured. We trudged farther down the narrow road. Fifteen refugees. The sun had finally surrendered and the temperature followed. A blind girl ahead of me, Ingrid, held a rope tethered to a horse-drawn cart. I had my sight, but we shared a handicap: we both walked into a dark corridor of combat, with no view of what lay ahead. Perhaps her lost vision was a gift. The blind girl could hear and smell things that the rest of us couldn’t. “Heartbreaking. They killed her,” said a voice behind me. It was the old shoemaker. I stopped and allowed him to catch up. “The frozen woman back there,” he continued. “Her shoes killed her. I keep telling them, but they don’t listen. Poorly made shoes will torture your feet, inhibit your progress. Then you will stop.” He squeezed my arm. His soft red face peered out from beneath his hat. “And then you will die,” he whispered. The old man spoke of nothing but shoes. He spoke of them with such love and emotion that a woman in our group had crowned him “the shoe poet.” The woman disappeared a day later but the nickname survived. “The shoes always tell the story,” said the shoe poet. “Proszę . . . bitte,” she begged, alternating between Polish and broken German. I couldn’t stand to look at her, at the streaks of dead Russian splattered down her sleeve. I started to walk away, her sobs flapping behind me. “Wait. Please,” she called out. A pain ripped through my side, forcing me to stop. The girl’s feet quickly approached. I resumed walking. “Thank you,” she chirped from behind. Copyright © 2016 by Ruta Sepetys. All rights reserved. No part of this excerpt may be reproduced or reprinted without permission in writing from the publisher.